It is a good idea to ferment vegetables in large quantities. It simply turns out better. It makes it easier to get the amount of salt right, to get the whole thing airtight and to get more lactic acid bacteria in the barrel in total. Something happens to the taste, the quantities of vegetables favour one another, improving the umami and all of the other flavours. A bit like with pea soup, as you know. Apart from all of the actual vegetables, three things are important for successful fermentation: the right salt content, the right temperature and an oxygen-free environment. The right salt content is 1-2 percent of the weight of the vegetables. Less salt – milder flavour and less acidity but shorter durability, and vice versa. The correct temperature is 18-22 °C, which is normal room temperature in Northern Europe. “An oxygen-free environment” is what is needed for the tightly packed strips. This is achieved by squeezing the vegetables tightly together. Combined, these three things allow lactic acid bacteria to grow, forming lactic acid, which in turn reduces the pH level, preventing harmful bacteria from thriving. It is useful to have tools for squeezing the shredded vegetables together if you ferment large quantities each time. For smaller amounts, fists work best. Traditionally, a pestle is used to pack white and red cabbage. While packing and working the cabbage is important, what you really want is to get it all air tight. That is the actual trick to success with sauerkraut, or whatever other vegetables you want to ferment. Modern fermentation in commercial kitchens can take a short cut using a dough mixer, having the dough hook work the cabbage. Or make use of a boiling pan and have the pan’s stirring mechanism do the work. Do not run it too fast or for too long, as that will turn your vegetables to mush. Pressing the vegetables into the barrel is essential, regardless of how modern you may be. All of the air pockets must be removed and doing that pushes up liquid to the surface. That means no nasty bacteria can get a hold, which in turn can cause mould. Place a weight on top so the cabbage remains covered with liquid and put a lid on the barrel (leaving it slightly open). Within a 24-hour period, the acidification process begins. Seal the jar or barrel. Over the next 2 weeks, the different lactic acid bacteria strains supersede on another. Then you have fresh sauerkraut, which just gets better the longer it is allowed to stand and mature. Allow it to mature in a refrigerator, this improves the flavours, making them more complex. Nutritional economist and fermentation nerd. Started “Syrat” (Fermented) in 2012 and has produced and sold fermented vegetables for shops and restaurants in Stockholm. After a couple of years, I discovered that I preferred teaching the technique to doing the actual production, because everyone is so surprised when they understand how easy it is. And how tasty it turns out. 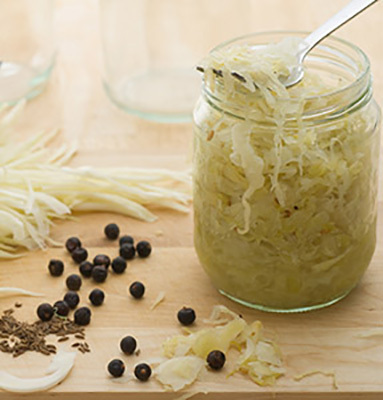 Favourite fermented food: white cabbage lightly spiced with cumin, juniper berries and bay leaves. Best enjoyed with some mature cheese.